It is 21 years since Steven Greenhorn’s road movie for the stage had its debut at the Edinburgh Traverse. And, while it is firmly set in the late 1990s, the story of a pair of Motherwell boys who set off for Thurso to sell a stolen surf board still resonates strongly. What really hits you, however, is the audacity of Greenhorn’s writing. It sparkles with comic banter and references ranging from comic-book violence to zen philosophy as it critiques Scotland’s relationship to tourism and industrial renovation. Greenhorn takes themes explored by 7:84 and crashes them into a setting that is on the cusp of entering the electronic age. In Ewan Donald’s peevish Alex and Martin Quinn’s geeky side-kick Brian, Greenhorn explores the relationship of urban society with its rural community. The central metaphor of passing places on single track roads feels more relevant every day. They rush forward pell-mell while those they meet – Eleanor House’s convincingly driven new-age wanderer Mirren, Emily Winter’s strangely not-quite Canadian geologist Iona, and Taqi Nazeer’s succession of unlikely guru figures – are more forward looking. Director Andrew Panton is not afraid to take a tumble into physical comedy as the duo’s nemesis, Binks – an entertainingly single-minded Barrie Hunter – bumps into a succession of strange Highland types, mostly played by John Kielty, as he chases them north. 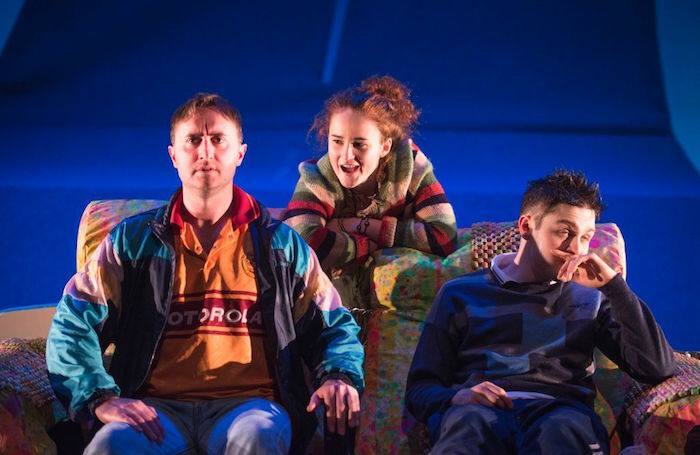 Becky Minto’s set, a road rising up out of the stage and curling over like a breaking wave, makes for a dynamic visual framework, while Kielty’s bass-heavy score ensures a thematic distinction between the play’s two strands. May 5, 2018, then touring to May 12.